This past October U. S. Department of Energy Solar Decathlon 2015 concluded with final judging of the 14 entries at Orange County Great Park in Irvine, California. The Solar Decathlon challenges collegiate teams to design, build, and operate solar-powered houses that are cost-effective, energy-efficient, and attractive. The winner of the competition is the team that best blends affordability, consumer appeal, and design excellence with optimal energy production and maximum efficiency. Stevens Institute of Technology won top honors overall (see photo); University at Buffalo, The State University of New York, took second place; and California Polytechnic State University, San Luis Obispo, came in third place. OWOE spent time at the site of the Solar Decathlon and toured the solar home entries. Although each one of the 14 homes was designed in accordance with the same rules, each one took their own unique approach in design. For example, the Stevens Institute of Technology’s winning entry was called SURE (sustainable + resilient) HOUSE, a high-performance, solar-powered house that is armored against extreme weather and can provide emergency power in the aftermath of a storm—packaged as a comfortable, beautiful shore house. The concept was envisioned in the aftermath of Superstorm Sandy that devastated the Eastern Seaboard in 2012. The University at Buffalo presented their GRoW Home, which reconceptualizes sustainable urban living with a small but dynamic house that adjusts to seasonal change through operable elements and a spatially flexible design. The Growlarium—part greenhouse, part solarium—supports vegetation year-round and provides an extraordinary living space. California Polytechnic State University presented INhouse, an interactive, intuitive, integrated home that is designed to integrate into the landscape of coastal California. OWOE enjoyed each of the homes in the competition and was impressed with both the ingenuity of the designs and the application of technology to create these net-zero homes. Our big question coming out of the competition is: “What is the next step for these homes?” Can any of these amazing homes jump from a college project to a commercial reality and make a contribution toward the world’s transition to a renewable energy future? 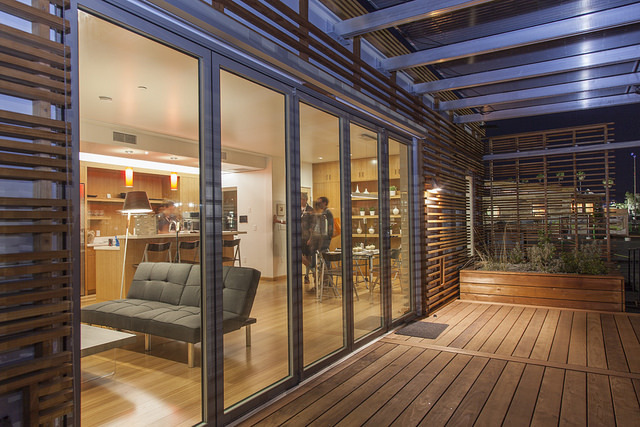 In our opinion, one home stood out for its shear ambiance and livability, transcending the pure functionality of the traditional net-zero home – Cal Poly’s INhouse. From its open floor plan, to its use of bamboo to create high-end finishes, to the spectacular exterior spaces that make the home seem double its size and are ideally suited for Southern California coastal living, one could easily envision living in this house. Let’s hope the team can build upon its success and take INhouse to the next level – the marketplace. As a follow-up to the competition, and to help share information on the home with our followers, OWOE is pleased to present a brief summary paper describing the design philosophy and details of Cal Poly’s INhouse solar home. Read an excerpt of the paper below, or download the full paper by clicking here. The Cal Poly entry to the US Department of Energy (DOE) Solar Decathlon 2015, INhouse, is intelligently designed to respond to the conditions of the climate in coastal California, such that the majority of its needs for heating, cooling and lighting are addressed architecturally. The supplemental systems necessary for the remaining space conditioning, lighting, and power needs are efficient and effective. The result is a home that meets both the residents’ as well as society’s need for ecologically responsive housing while simultaneously creating an environment that delights the resident both experientially and thermally. Our design combines materials and systems to create a modern California aesthetic. Intuitive: Through a precisely designed envelope and passive systems, INhouse is crafted to maximize the thermal and luminous comfort of its residents. Residents can easily learn how to operate the passive systems of the house – sliding screens, sliding glass walls, operable windows – in order to maintain their daily and seasonal comfort. Interactive: INhouse provides an environment that enables the resident to adjust the house to meet changing needs. When the weather is nice, s/he can open the folding glass wall between the living module and the outdoor solar bifacial room. When the sun is least harsh or views are too good to pass up, the resident can push open sliding screens along the southern edge of the bifacial room. Integrated: The home is designed around a core that contains its active intelligence – mechanical, electrical, plumbing, and monitoring systems. INhouse aims to unify all of the home’s components into a coherent whole – from passive to active, indoor to outdoor, and architecture to engineering. 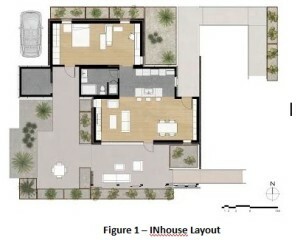 INhouse, as illustrated in Figure 1, is elongated on its east-west axis and includes two wings (shaded in beige) – one public and one private – linked by an active core (shaded in dark gray) that contains the home’s mechanical, electrical, plumbing, and monitoring systems. The private wing is located on the north and includes a master bedroom and a flexible space which may serve as a library, office, or secondary bedroom space. The public wing on the south incorporates entertainment and dining spaces with thoughtful linkages to the exterior spaces and the views beyond. On the exterior, the core and the wings are formally and materially differentiated through volume as well as materials. The passive wings are lower, more porous, and are defined by a redwood screen designed to shade the envelope as well as to highlight the origin of our project, the central coast of California. The taller active core is more sleekly designed, using panelized construction, and enclosing the home’s comfort systems. To ventilate, all the windows are operable, including the north-facing clerestories in the taller core, which are designed to promote stack ventilation. The public wing seamlessly connects to a generous outdoor area, emphasizing the outdoor living potential afforded by the coastal California climate and doubling the home’s public space. The outdoor decks provide residents with additional square footage that is essential for an otherwise modest house footprint. This outdoor space is adaptable through operable shading screens that allow user–defined comfort in response to the changing seasons. View or download the full paper by clicking here. To learn more about the Solar Decathlon or Cal Poly INhouse, visit OWOE Amazing Energy.